From the left: Chadwick Cherry tomatoes, Mammoth Melting Sugar Snap Peas, Maxibel Haricot Vert Bush Bean. Hope you’ll enjoy your dinner as much as we will! 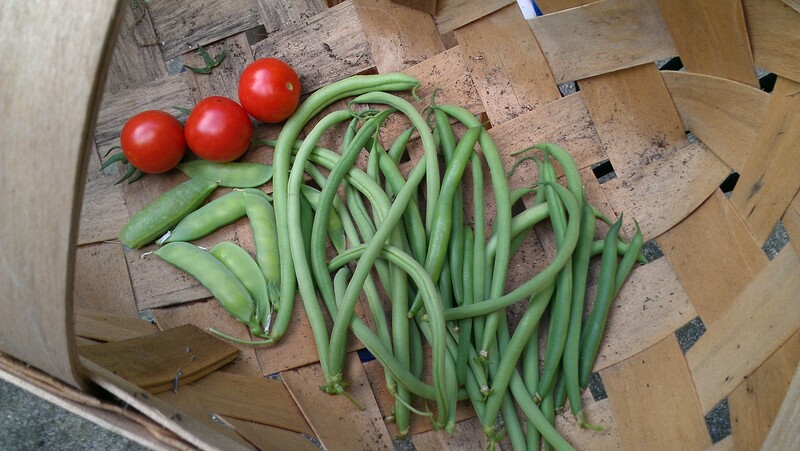 This entry was posted in Gardening, Self-Sufficiency, Simple and tagged garden, green bean, harvest, peas, tomato, vegetables. Bookmark the permalink. Oh, man, you’re so far ahead of us down there in Atlanta! But I see in your photo the sign of things to come! We have a ways yet before we get a harvest. Seeing posts like yours makes me impatient, just knowing what is on the way! Congrats on your harvest! Don’t you just love pulling food out of the garden?